Valletta 2018 Chairman Jason Micallef with Big Exhibits director Jean Pierre Mizzi using one of the electronic interactive units that will be installed in the coming days. 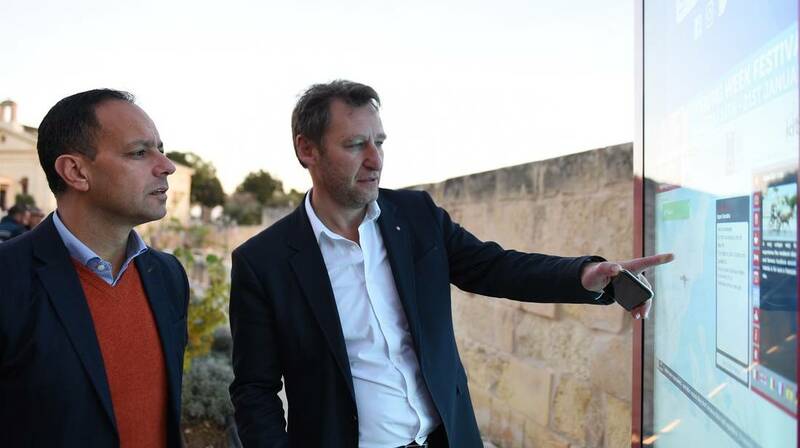 Valletta 2018 Chairman Jason Micallef together with Big Exhibits director Jean Pierre Mizzi unveiled the first in a set of electronic interactive units that will be installed around Valletta at Castille Place earlier today. The outdoor units are the first of their kind in Malta and will serve as information hubs providing users with updates on the Valletta 2018 Cultural Programme and giving users more details regarding Valletta 2018’s opening celebrations which will be taking place on the 20th January 2018. Apart from this, they will also be providing news and weather updates, as well as a wayfinding system for users navigating Valletta. 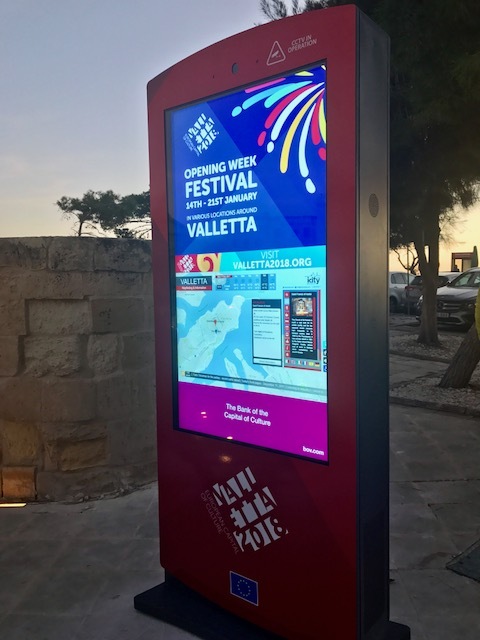 As part of Valletta 2018’s commitment to making Valletta more accessible, these screens are also designed to be user friendly for wheelchair users. Users may also take selfies with various sites around Valletta acting as a backdrop for their photos. Ten units will be installed around Valletta in the coming days, including Castille Place, opposite Parliament in Republic Street, near Hastings Gardens, opposite Law Courts in Republic Street, next to the lift entrance at Lascaris Wharf, next to the entrance of the Malta Experience in Mediterranean Street, next to the entrance of the Valletta Cruise Port, as well as three units around the Triton Fountain area. These units are part of a public-private partnership.